The newest edition of the 2019 Warsaw Meeting Guide is now available. 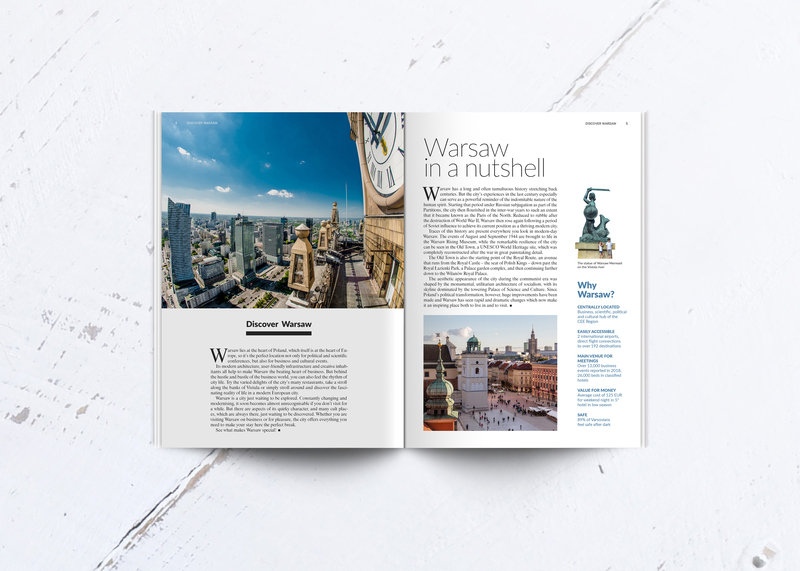 The publication of the WOT’s Warsaw Convention Bureau is a guide to Warsaw prepared for the meeting planners, showing the city as an international meetings destination, i.e. the most attractive and professional Polish location for organizing convention, trade fair, incentive and all other kinds of events. The catalogue lists all major convention and event facilities in Warsaw, presents the best MICE products and services offered by the recommended companies operating on the Warsaw market, and suggests restaurants most often picked by Warsaw CvB clients. The catalogue will be distributed to international meeting planners during, among other things, international events which the Warsaw Convention Bureau is going to attend in 2019, will be provided to the representatives of the local scientific community and will be supplied to local and international partners cooperating with the association.